I love Mordles. 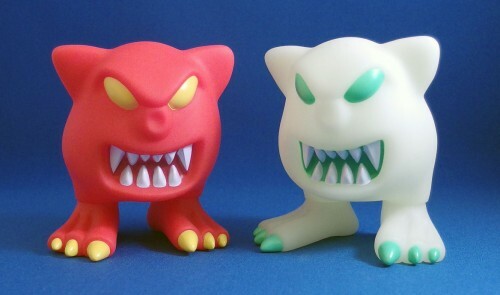 As described at length in my previous review [Review > Mordles Mega-Review (Mordles, ToyFinity)], I am addicted to the little buggers and adore my little demon army. As thorough as my previous review was, I’m back to cover the latest in the series, the awesome glow-in-the-dark (GITD) series, which is available right now at the Mordles store (if they’re not already sold out!). It is, admittedly, a little bit trickier reviewing something like Mordles than other action figures – there’s little to no articulation to speak of (the feet of the larger Mordles do move), and even paint apps are minimal, but these are such spectacular little guys that I have to write about them! Now, I know that in general adult collectors despise “action features,” though presentation-based features that don’t get in the way of sculpt or articulation are usually embraced, like Roboto’s working cogs. Does glowing in the dark count as this kind of feature? I think it does, and I think it’s awesome. I love glow in the dark figures – everything from the terrific Monev the Gale variant to neat twists like Night Fighter Robocop to characters in which glowing is a central defining feature like Scareglow, I love it to bits. I’ve even bought some glow in the dark paint to touch up some figures! Even before I went crazy for the Mordles I was still intrigued by the notion of glow in the dark ones, and so I am thrilled to bits to finally get these. They were absolutely worth the wait. 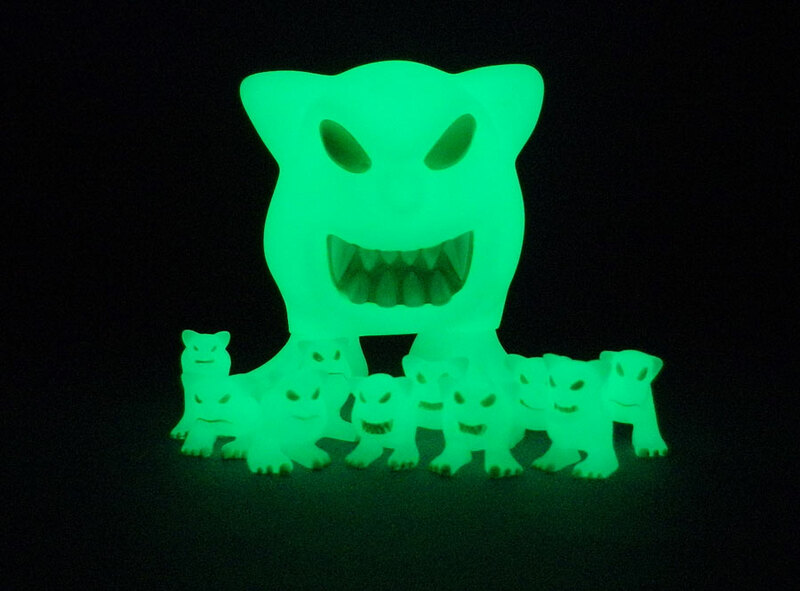 The regular, smaller Mordles – which ToyFinity calls “Geist” Mordles – are cast in GITD plastic with a terrific green on their eyes, mouth and nails. Featuring the same unique sculpts as the previous releases, these guys look fantastic! The paint apps here are absolutely perfect, with a good contrast between the glow-in-the-dark plastic and the paint. In the dark, they glow spectacularly, and the non-glowing eyes, mouthes and nails add a very sinister look to the little demons. It’s great! The larger – I’m going to call it KING MORDLE, although others have referred to it as “jumbo” – is called GEIHOZA! The Giant Glow Mordle (complete with the exclamation mark at the end) and he is amazing. I didn’t get a chance to comment on the last review, as Poe covered the Imbalance of Blood Mordle, but these big versions are just amazing. Standing at about four inches tall, they’re really big and look suitably imposing around any of your figures, from 3.75″ Star Wars figures to your larger NECA Aliens. They’re big dudes and, made entirely of hollow rotocast vinyl, have a nice weight and feel to them. They’re very durable and will stand up to play, and being a part of the Glyos-system they have the added feature of removable feet, so you can plug in other vinyl Onell parts or just roll them around the house. Such fun!! So GEIHOZA! is distinct from his Imbalance of Blood brethren by being cast from GITD plastic like his smaller followers, and again the effect is terrific. That same green paint adorns his empty eyes, his mouth and nails, and it looks superb. One minor note – his teeth are painted white but do not glow, which means that when he glows in the dark he has a big empty block for a mouth, wherein glowing sharp teeth would have been more effective. This is fairly minor and can (and will) be solved with a dab of glow in the dark paint – otherwise, GEIHOZA! is absolutely perfect. So both my love of Mordles and my army continues to grow, with this fantastic new addition to the collection. Whereas previous releases have appealed very much to a specific niche, I feel like the glow in the dark feature is a far-reaching novelty that will appeal to more collectors than ever. Unfortunately, the giant Geihoza sold out within five minutes and the Geist Mordles are also sold out as of this posting. Given their popularity, it can be hoped that there will be another glow-in-the-dark release (though likely with different paint highlights). Keep an eye on the ToyFinity blog for the latest Mordles news, and be sure to check out the Mordles comic. Geihoza and the Geists will return! Details to come. Don’t pay scalpers! This review felt like a big tease until I got to the end and saw that these are being re-released. Yay! P.S. Can you show what the large Mordles look like next to other action figures? It’s hard to guess the scale. Thanks! Oh, there we go! Thanks, Poe. They're smaller than I expected, which makes them even more adorable. I'm definitely going to try and get the large GITD Mordle next time it goes up for sale.